The task of responding to RFPs is just like any other habit—some are good, some are bad. A good habit is using intelligent search in your answer library to find the perfect RFP response. A bad (or, if you prefer…not-so-good) habit is pillaging endless spreadsheets at midnight when your RFP is due first thing tomorrow morning. No matter the size of your organization, the RFP response process is complex. And habits? Well, they rule your organization more than you think. The goal is to transform bad habits into good habits. That all starts with deciding it’s time to make a positive change at your organization, so you can achieve success. Why change your existing RFP response process? Because you want your organization to be liberated from bad habits, so you can make more room for the good. We don’t often take the time to investigate how habits can impact our organization. But it’s critical to acknowledge them—then focus on improvement. Because a team following good habits is a successful one. An organization with good habits is completely focused on achieving the best results. They aren’t spending precious hours with manual processes, because they’re using technology that automates repetitive tasks and boosts productivity. The team is in sync, working toward the same goals together instead of working separately in silos. Every day the organization benefits from these positive habits. Over time, with regular good habits, more success is achieved. Think of your health. What is one bad habit you are trying to change? Why are you working so hard to change that bad habit into a good one? Maybe you want more energy. You want to feel happier. Or, perhaps you want to live longer. Your RFP response process can experience those same benefits with improved habits. The health of your organization isn’t all that different from physical health. 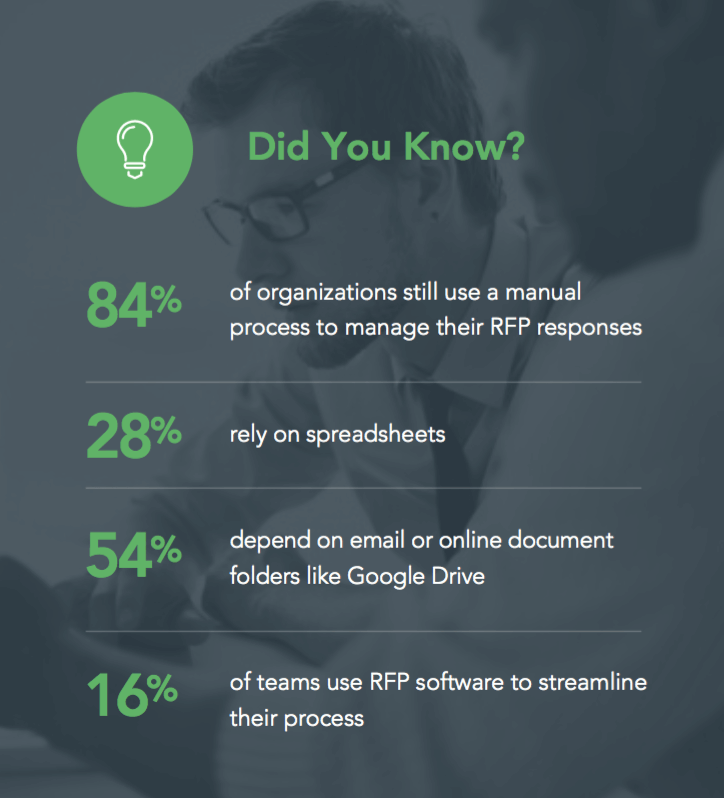 Let’s say you’re like the majority of organizations, the 84% still using a manual process to respond to RFPs. Turning this bad habit into a good one might mean adopting RFP software to help you manage the process. Saving time gives your team more energy to focus on high-priority tasks. Without inefficiencies and silos, they’ll feel happier working together toward a common goal. 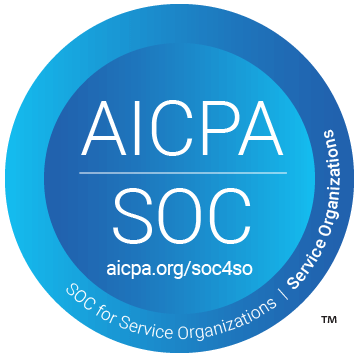 A more sustainable process will help your organization live longer. When you improve any type of habit, it feels good, right? The RFP response process can undergo the same transformation with a mindset switch. Whether you’re using RFP software or a manual process to pursue new opportunities, there is always room for improvement. Which is why we started an RFP response habits survey last year, to learn from other professionals in our industry. 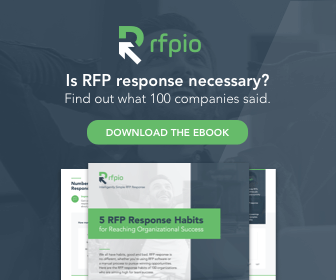 100 organizations came together to reveal their RFP response habits in the survey. We packaged them up into an easy-to-read resource, to help you know exactly where you stand and encourage you to aim even higher for success. Ready to improve your RFP response habits? Great. We want you to as well! That’s why we made this ebook a direct download for you, with no “contact information” strings attached.